Students! Get dressed up and come out for a spaghetti dinner, games and photo ops. 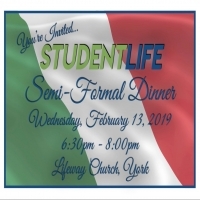 Invite a friend or date to the StudentLife Semi-formal Night.